Practical and pretty double oven glove featuring ‘The Country Set’ images painted by Hannah Dale of Wrendale Designs, from Pimpernel. This useful double oven glove features delightful paintings by artist Hannah Dale, inspired by her life on a farm in the British countryside. The design features images from her ‘Country Set’ collection, including a splendid badger, a hare, a duck, a pheasant, and a fox. 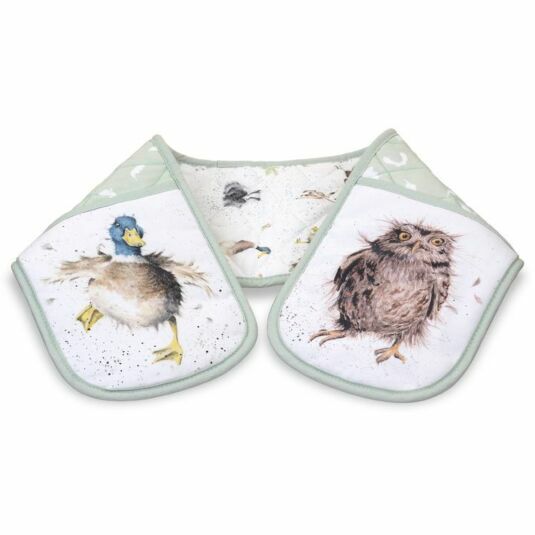 On the main mitts are lively portraits of an extraordinarily fluffy owl and a duck with flying feathers, which has just landed. All the images are painted in delicate brushstrokes and lovely colours. The animals and birds are not only beautifully observed but also imaginatively portray the characters of the subjects. Scattered among the animal images are acorns, horse chestnuts and fluttering leaves, intermingled with a speckling of paint. Edged in duck egg green fabric, with a quilted back featuring a pattern of white silhouetted leaves, acorns and sycamore seeds, the oven glove would make a lovely housewarmng gift. There are additional matching mugs and kitchen accessories in the range. This range of kitchen accessories and matching mugs was created from images produced for Wrendale Designs by artist Hannah Dale. Each image is delicately delineated with the soft brushwork and subtle colours which are trademarks her style. Hannah is an ex-stockbroker turned farmer’s wife who, inspired by her rural married life, embraced her artistic roots and began painting the animals in the landscape around her. Do not bleach, do not dry clean, iron on reverse. Wash at 40 degrees.